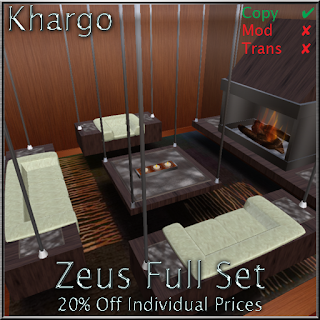 Khargo: Furniture and Design: Zeus! The store is finally finished and we have some new items out. The Zeus is our latest living room set and our favourite so far. It's a modern hanging set comprising large and medium sofa, single seater, table, fireplace, candles and rug. As with all our furniture it is packed with options - all accessed by a menu which lets you change textures (over 80 textures included), tint, shininess, glow and brightness and poses - couple poses on the large sofa, singles on the others and several on the table too :) You can also choose to buy the full set or just part. As it has the same textures as all our other furniture you can mix and match between sets for a more eclectic look. Come and see, try and buy at our NEW store inworld!